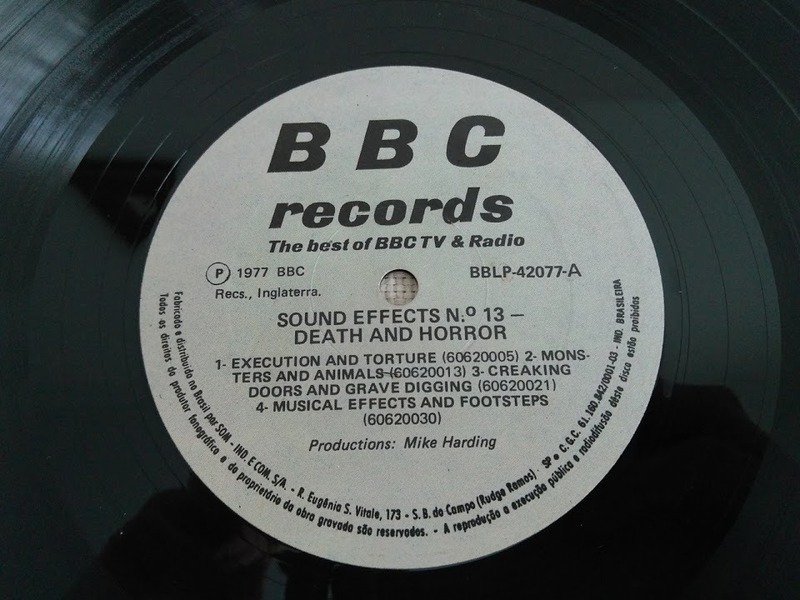 In 1967, the BBC created its own record label, designed to exploit the demand for commercially released TV tunes, comedy shows and, finding an unlikely niche in the market, sound effects. These LP’s appealed to amateur film-makers, those attracted by the lurid and engaging sleeve designs and people with a ‘healthy’ interest in the subject matter. They ultimately released dozens of themed records across a whole host of sometimes baffling subjects (worldly travels, transport…farms!) but perhaps the best remembered are their three horror-related collections. Volume 1, the endearingly-titled Essential Death & Horror (actually volume 13 in the BBC’s run of releases) appeared in 1977 and offers a dizzying collection of 91 different (though sometimes very similar) effects, handily batched together under the following headings; Execution and Torture, Monsters and Animals, Creaking Doors and Grave Digging, Musical Effects and Footsteps, Vocal Effects and Heartbeats and Weather, Atmospheres and Bells. It is quite likely that many vegetables were harmed during the creation of the albums – ‘arm chopped off’ sounds like a cabbage being cut, ‘head chopped off’ rather like a carrot being attended to. No matter, for the wide-eyed imaginative youth, these were heady and evocative sounds, quite sensational to imagine that such barbaric acts had captured by Auntie Beeb for posterity. Particular favourites of my own include the actually rather disturbing electronic workout ‘Phantom of the Opera Organ Sounds’, ‘Monsters Roaring’ (pigs being interfered with, possibly) and ‘neck twisted and broken’ (broccoli attacked). Such was the success of Volume 13 (or 1 if you prefer), a follow-up album arrived in 1978 – Volume 21’s More Death and Horror. Rather more ragged than the first release, we are treated to even more inclement weather, bells tolling and some overly comedic death rattles – of particular note is ‘death by garrotting’, a performance that would frankly stop a pantomime for being too silly. Regardless, there was one final outing, the paltry twenty-five minutes of Volume 27’s Even More Death and Horror. Easily the most startling record of the three, the methods of torture are truly imaginative; ‘self immolation’, ‘female falling from great height’ and ‘tongue pulled out’ are all very pleasing, though how many home videos these were used in is of concern. Appearing three years after the second volume, this was the last hurrah for audio maiming and is the rarest of the LP’s to find. It should come as no surprise that all three albums are the work of the BBC’s Radiophonic Workshop, set up in 1958 to create music and sound effects for initially radio and then television – their most famous work being the theme tune and effects for the long-running TV show, Doctor Who. “Prior to my arrival as the Head of Creative Services for BBC Record and Tapes back in, many records were sent out to the public on demand on cassettes. There was a high request amongst Film Companies (amateur and professional), theatres groups, radio broadcasting companies world wide for sound effects. The BBC Radiophonic Workshop had some of the best sound engineers and technicians in the world creating and recording sounds for every conceivable noise and bizarre request. They had come up with a selection to meet the need for horror films and plays, and spent some time chopping up cabbages and spooning out melons etc to capture that evil noise. I decided that a graphic illustration was need to enhance the product that had up to then been sent out on tapes and some in plain record sleeves. It was an amazing success and took us all by surprise, some press featured it and the then self- appointed guardian of British morals sent a very strongly worded letter to me suggesting that I was corrupting the minds of young people with evil images.